Louis Andriessen — widely regarded as today’s leading Dutch composer and a central figure in the international new music scene — is the third recipient of The Marie-Josée Kravis Prize for New Music at the New York Philharmonic. 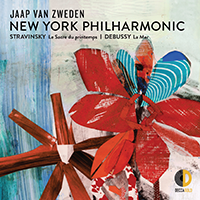 From a background of jazz and avant-garde composition, Andriessen has evolved a style employing elemental harmonic, melodic, and rhythmic materials, heard in distinctive instrumentation. His inspirations range from the music of Charles Ives in Anachronie I, the art of Mondrian in De Stijl, and medieval poetic visions in Hadewijch, to writings on shipbuilding and atomic theory in De Materie Part I. Mr. Andriessen’s compositions have attracted leading exponents of contemporary music, including the two Dutch groups named after his works De Volharding and Hoketus. Other eminent ensembles that have commissioned or performed his works include Asko|Schoenberg, San Francisco Symphony, Los Angeles Philharmonic, BBC Symphony Orchestra, Kronos Quartet, London Sinfonietta, and the Bang on a Can All Stars. Cross-disciplinary works include the theatre piece De Materie, created with Robert Wilson for Netherlands Opera; three works created with Peter Greenaway (the film M is for Man, Music, Mozart, and the stage works ROSA Death of a Composer and Writing to Vermeer); and collaborations with filmmaker Hal Hartley, including The New Math(s) and La Commedia, an operatic setting of Dante. Recent commissions include Agamemnon for the New York Philharmonic (being premiered Fall 2018); Mysteriën, premiered by Amsterdan’s Royal Concertgebouw Orchestra and Mariss Jansons; and The only one for Los Angeles Philharmonic (April 2019). His newest opera, Theatre of the World, about the 17th-century polymath Athanasius Kircher, received first performances in Los Angeles and Amsterdam in 2016, and was released on disc by Nonesuch in 2017. Louis Andriessen held the Richard and Barbara Debs Composer’s Chair at Carnegie Hall, was awarded Composer of the Year Award by Musical America in 2010, and won the 2011 Grawemeyer Award for his opera La Commedia.